The online training program, “Think About It,” developed by the University of San Francisco, Calif., and CampusClarity, gets high marks from NASPA—Student Affairs Administrators in Higher Education. Our course is designed to train incoming college students for the responsibilities and challenges of life on campus. NASPA, which represents 1,400 campuses in the United States and abroad, recognized the program with its 2014 Excellence Award for Intervention and Prevention. In 2013, the program won a Stevie Award for the best online course. When I became the new vice provost for student life in 2011, I discovered that the substance abuse prevention activities in place then had little influence on students and that online programs acted as more of a punishment than a positive learning experience. Over an 18-month period, students, faculty, and staff worked with 40 focus groups to gather input that could help determine the elements of a more effective effort—one that would prepare students to make healthy choices and minimize risks associated with alcohol, drugs, and sexual violence. Students provided feedback on everything, from the color palette, font, and interactive features, to the language, situations, and dialogues used throughout the course. Once we had a prototype, USF invited 16 other schools to provide feedback and propose customization features that would help them tailor the course to their respective campuses’ needs. Next, student life professionals, faculty from the university’s psychology department, and CampusClarity, a service from LawRoom, which helps employers and educators with legal answers and compliance training, worked together to create a comprehensive program. It was designed with a broader goal of enabling honest conversations around campus that would lead to action; changes in behavior; and a safer, socially responsible community. 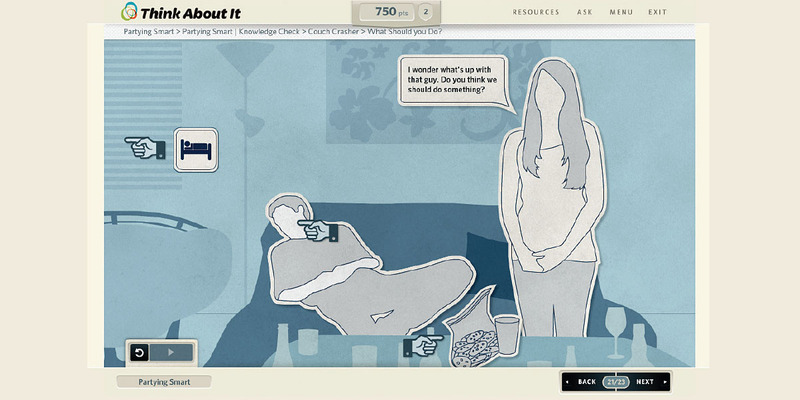 The project led to “Think About It,” an online tutorial that acknowledges the incoming student’s potential vulnerability in a new environment. For students who do not have much experience with alcohol, the course validates their experiences, while giving them a model for how to be safe in a variety of situations. For example, a short video shows two bartenders giving advice about the amount of alcohol in a standard drink and strategies to minimize dangerous drinking behaviors. University of San Francisco’s online training program teaches students ways to minimize risks associated with alcohol, drugs, and sexual violence. USF requires that all first-year and transfer undergraduate students complete the program before arriving on campus. Once enrolled, the student receives an e-mail 30 days before classes start, with directions to access the course. Though all the data is disaggregated (so it is unknown what students may have answered on an individual question), the program tracks progression through the course through its advanced reporting and data tools and sends students reminders to complete the work. Students who don’t complete the course are fined $100 and may be ineligible to register for the following term. Talk About It. This is a complementary collection of workshops, programs, and educational materials designed to promote change by engaging stakeholders in the entire campus community. Do Something About It. This educational component focuses on intervention—recognizing a risk situation and stepping in to stop it. The University of San Francisco leadership continues to believe strongly that prevention is key to tackling campus violence. With these new programs, we believe we are adding solid support to match our good intentions. SUBMITTED BY Peter Novak, vice provost of student life, University of San Francisco, Calif.